At the LaBovick Law Group, we are proud of our custom, one-of-a-kind mock courtroom that sits right next to the lobby in our office. We can offer both our attorneys and clients another level of comfort going into the litigation stage of a case. We can prepare our attorneys, our experts, our witnesses and our clients in this courtroom, so when the day comes to litigate a case in a “real” courtroom, we will be 100% ready. We will even hold full mock trials in our courtroom to present a case in several different ways to ensure the best outcome. Have a student group that could benefit from some court time? Use our courtroom! 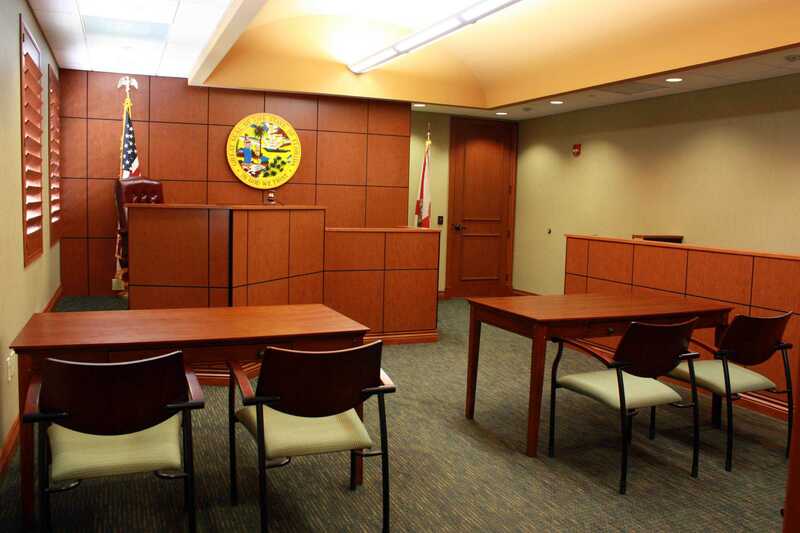 Need a courtroom scene for your movie or commercial? We even rent out our mock courtroom! What type of cases do we use our mock courtroom for? Personal Injury: If your accident case cannot be settled in a matter or value sufficient to your needs, we will litigate it on your behalf. This means we’ll take your case to court. Any injury case, especially relating to auto accidents, boating accidents, truck accidents and cruise accidents have the potential to be brought in court. Social Security Disability: If you have received two denials in your Social Security disability case, it’s time for a hearing. Sometime this occurs in a courtroom in front of a judge, and other times this occurs in a meeting room in the courthouse. More times than not, a vocation expert will even be present during a hearing. This courtroom experience allows our attorneys and clients to be fully prepared no matter what situation arises.